Since Chris’s blog post about his t-shirt seems to have been a hit, I should post about it here as well. The story is this … Chris has been wanting to learn electronics for a while, so when SparkFun Electronics had a give-away in January he jumped at the opportunity and got $100 worth of electronics (this deal was given out to 1000 people). This stuff included a LilyPad Arduino and LEDs, etc. For a while Chris brainstormed on what to make with it and decided to make a T-shirt that reports how many emails are in his inbox. 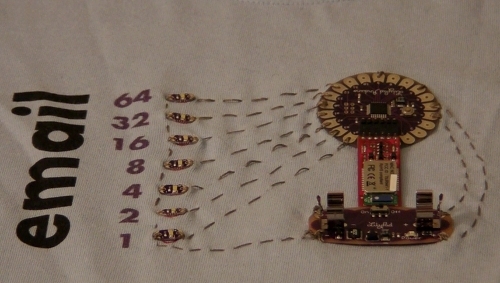 I helped out too, I’m responsible for the design: vertical binary LED layout, the custom T-shirt printing (from cafepress), and all the placement and sewing of items onto the shirt. More recently we attended PAX East this weekend. On Friday Chris wore another custom shirt we ordered from Cafepress (pictured on the right). The idea for the text was entirely Chris’s (he came up with it over beer at a post-Libre Planet party at the Acetarium); Mako suggested the font choice (Impact). I think it’s hilarious. If you don’t get it, try watching this Daily Show Chatroulette skit. This entry was posted in Uncategorized on March 30, 2010 by mad. The color force favors confinement because at a certain range it is more energetically favorable to create a quark-antiquark pair than to continue to elongate the color flux tube. This is analoguous to the behavior of an elongated rubber-band. Biologists and other fields have been content to develop their secret lingos using a few new words and a lot of acronyms. It never occurred to us to simply re-use common words to mean utterly different things so that when I’m talking about “underpants” I actually meant “retrotransposons”. That genius is reserved for physics. This entry was posted in Uncategorized on March 18, 2010 by mad.